The influenza virus vaccine is frequently updated to ensure that it protects against infection with circulating virus strains. In some years the vaccine matches the circulating strains, but in others, there is a mismatch. The result is that the vaccine is less effective at protecting from infection. During the 2014-15 influenza season there was a mismatch due to growing the vaccine in embryonated chicken eggs. A new H3N2 strain emerged during the 2014-15 season with a mutation that introduced a new glycosylation site in the viral HA glycoprotein. A single amino acid change, from threonine to lysine, allowed attachment of a sugar chain to the HA molecule. The influenza vaccine was updated in the 2016-17 season to include the strain with the new glycosylation site, but its effectiveness still remained poor. This outcome was puzzling because the vaccine was a good match with the circulating strain. A key to solving this puzzle is the fact that most influenza vaccines are prepared in embryonated chicken eggs. When the H3N2 strain with the glycosylation site is grown in eggs, the mutation is lost. Therefore the vaccine given to people during the 2016-17 season was a poor match with the circulating strain – it did not have the extra glycosylation site! 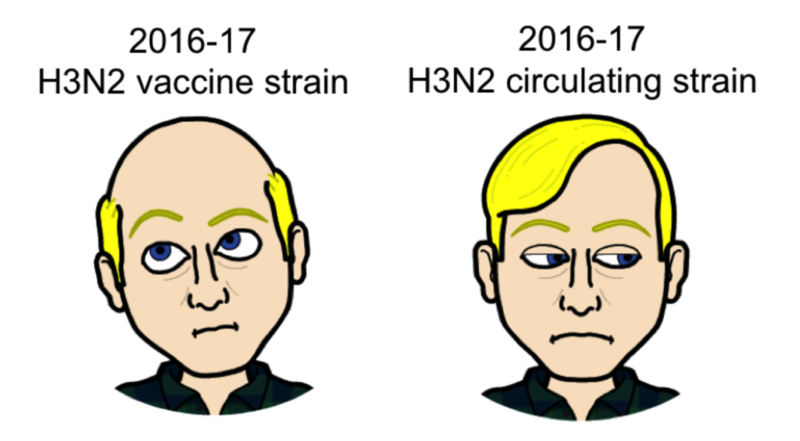 To understand how the change in HA glycosylation could affect vaccine effectiveness, two different H3N2 strains were produced, one with the new glycosylation site, and one lacking the site. The binding of these two viruses to a panel of human monoclonal antibodies raised against a 2009 H3N2 virus – which lacks the glycosylation site – was then determined. Most of these antibodies could bind to an H3N2 strain lacking the extra HA glycosylation site. But few of these antibodies bound to an H3N2 strain with the glycosylation site. Next, ferrets were infected with the two H3N2 influenza viruses – with or without the extra glycosylation site. Sera were obtained from these animals and used in neutralization assays. Antibodies from animals infected with H3N2 virus lacking the glycosylation site recognized the same virus more efficiently than virus with the glycosylation site. These observations indicate that most of the antibodies induced after immunization with the H3N2 strain lacking the glycosylation site are directed at an antigenic site (called site B) that is physically blocked when sugars are present. This explains why immunizing with the sugar-less H3N2 virus grown in eggs did not protect against the circulating H3N2 strain. In that strain, the antibodies induced by the vaccine could not bind antigenic site B, because it was blocked by sugars. Another way to look at this problem is illustrated below, provided by Scott Hensley, the senior author of the paper describing this work. Think of Scott’s bald head as site B, and the toupee as the new glycosylation site. Not all influenza vaccines are made in eggs. Flublok consists of HA protein produced in insect cells, and this procedure does not select for loss of the extra HA glycosylation site. Sera from humans immunized with Flublok in the 2016-17 influenza season reacted more strongly with the H3N2 strain with the glycosylation site than did sera from people immunized with egg-grown vaccine. There are two important lessons from this story. First, the efficacy of the influenza vaccine can be affected by single amino acid changes either in the antigenic site, or which allow attachment of sugars that block the site. Both interfere with antibody binding. Perhaps more importantly, we should move away from producing influenza vaccines in systems such as eggs that can select for these mutations. I’d like to see a study that looks at the possibility of antibody-dependent enhancement (ADE). The Canadian study “A Perfect Storm: Impact of Genomic Variation and Serial Vaccination on Low Influenza Vaccine Effectiveness During the 2014–2015 Season” by Skowronski et al shows that serial vaccinations (being vaccinated year-after-year) lowered vaccine effectiveness (VE). Egg-adapted changes may account for the poor mismatch/low VE for the 2014-15 season but it does not account for the statistically significant impact of serial vaccinations driving down VE. Those vaccinated in 2013-14 had a lower VE than people not vaccinated. Those vaccinated the prior 2 seasons were lower yet. The 3-years in a row group had the lowest VE in the study!